Because what we have to offer is unique in the world of fly fishing. We are what a total quality fly fishing experience once was and should be. We are a combination of world class solitude dry fly fishing, great old world hospitality with an emphasis on comfort and culinary delights. We are very easy to get to and an outstanding value. In addition we can honestly say that we are truly unique and exceptional in fly fishing destinations. The first criteria was simply exceptional fishing, endless opportunities and solitude the way it once was. We did this. This is a place where the waters are extremely well managed, the wild fish stocks are incredible and access is in one fashion or another very limited. The best part is that you can still fish without the crowds so common to most destinations we have visited. In fact, you can still spend a day catching huge numbers of fish on a dry fly and likely never see another angler. The fly fishing experience we are able to provide is truly amazing like a time gone by. Like a time most of us can only remember fondly. It still amazes us and we do not take this for granted. Secondly, we did not want a large lodge nor did we want to be a small shop outfitter. After experiencing just about everything possible, a medium sized customer oriented environment is what we wanted to create. We did this with The Guest House. This is a place where the numbers of guests are limited to only a few ( 4 to 6 ) at any given time. The atmosphere is simple, relaxed and very much home away from home. We enjoy comfort so we have created very comfortable accommodations for our guests. We enjoy great food so we have created menus that are wholesome and delicious. We are within minutes of everything we could ever require but far enough removed to enjoy our solitude. We keep it extremely simple. We do not tell you when to come and go; in effect, this is your home while you are with us. When you go out for a day of fishing, you return on your time, there is no diner bell but when you return a great meal will be waiting for you and a great relaxing atmosphere will be the perfect end to a perfect day. Last on our list was to be situated so everyone could get to us easily. Being located in Cranbrook the entire world has easy access to us. With major airports within easy driving distance on great scenic roads we are easy to get to. Some of our customers from the U.S. northwest, California, Texas and the great trout states visit with us a couple of times per season. They have become old friends we look forward to seeing. It is wonderful to be situated in a place easy to reach and still offer world class fly fishing on wild untouched trout waters and of course, solitude. 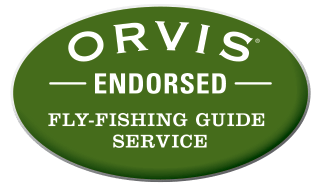 There is a lot more to it of course like our great ORVIS Endorsed guides and the sheer logistics of all that is involved in operating a world class fishing destination but we have accomplished this as well. In fact, all of this stuff comes relatively easy to us and we think we know why. We are having a great time like our customers and perhaps that is the bottom line. It is simply fun and rewarding doing what we have always wanted to do. It is a great pleasure being able to build a great business around all the things we have ever dreamed about in fly fishing. It is a great joy when everyone returns to The Guest House at the end of the day tired, hungry and happy and ready to tell a great tale of a great day of fly fishing.